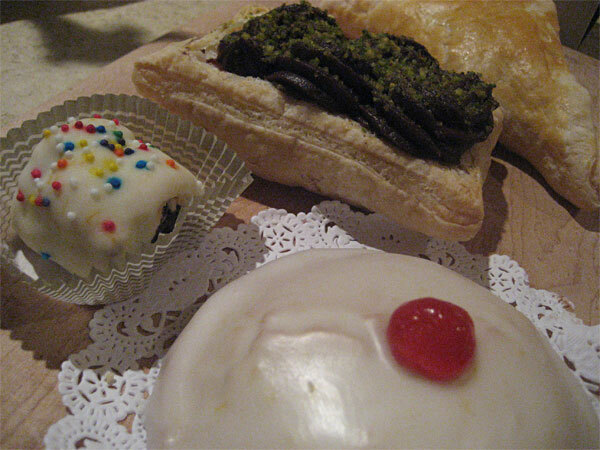 LTHForum.com - Pasticceria Natalina--Andersonville's new Sicilian bakery! 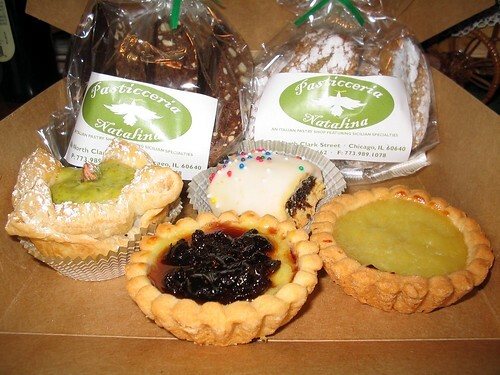 Pasticceria Natalina--Andersonville's new Sicilian bakery! 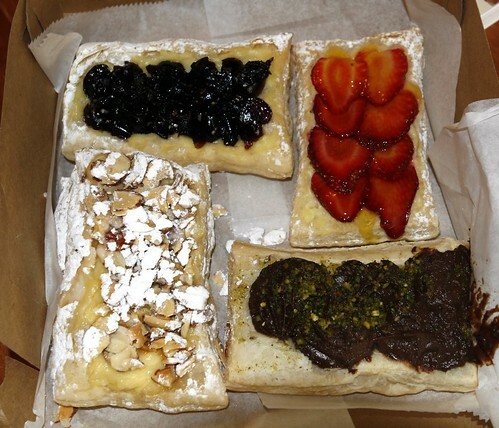 LTH Home > Chat > Eating Out in Chicagoland > Pasticceria Natalina--Andersonville's new Sicilian bakery! Alerted by nsxtasy's post on Chowhound, I walked over to the brand-new Pasticceria Natalina, a short half-block north of Swedish Bakery in a neighborhood that's delighted for the change of pace. The shop is owned by a young couple, Nick and his wife Natalie. Borrowing from Metromix, we learn that Natalina is "Natalie Zarzour, a Chicago area native who trained in classic French pastry techniques in Lebanon. Her Sicilian heritage--and memories of the Italian-American bakeries in Melrose Park and Elmwood Park--inspired her to open her own shop. 'I looked around and realized, you can't get this stuff around here,' says the current North Sider." The store is new--Nick said today was only their second day--and so the cases are not filled yet, though they have specific items planned. No labels and no prices yet, but both Nick and Natalie were eager to explain every item on display and this will come. Nick was also particularly proud of the fact that their fillings (such as fig and pistachio) are made from scratch, not bought. In addition, they will do special orders, including wedding cakes and so forth. As you can see from the photo, I bought a variety--after all, how else to tell? I can tell you that having now tasted much of what I bought (but not all of it), that it's excellent. Not merely good or very good, but excellent. We were both impressed and will be back. Yum! nsxtasy noted in her post that prices are--perhaps--a trifle high. On the other hand, this is no longer an inexpensive neighborhood--especially on Clark Street--and I truly hope we can support them. I find their prices more reasonable than Urban Epicure's ever were. Based on their enthusiasm and the apparent quality of their stuff, we wish them much success! Last edited by Gypsy Boy on March 16th, 2007, 11:21 am, edited 1 time in total. The current Dish Newsletter has "6 Questions for Natalie Zarzour, 24, chef-owner of Andersonville’s new Sicilian pastry shop, Pasticceria Natalina". A trifle expensive? They're bloody expensive, these custard-filled pastries (one chocolate, one cherry) were $6.95 each. But everything I tried from there-- these plus samples of the almond cookies and a coffee cake-- was fine, delicate, handmade, the antithesis of the Rolf's Patisserie school of dessert masonry built to withstand jostling in a truck over potholed streets all day long. 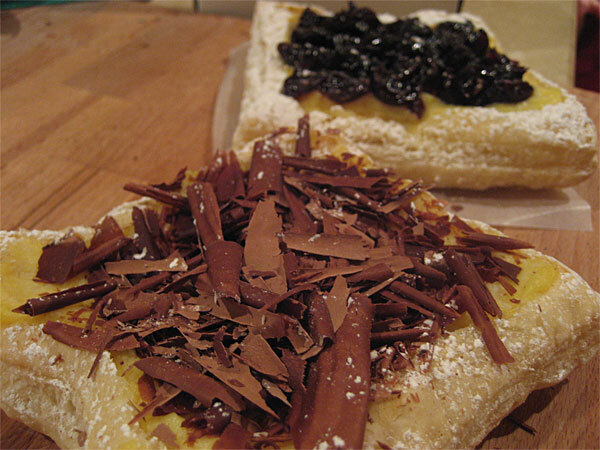 The custard-filled pastries had layers of the finest, thinnest pastry flakes, a custard that was sweet but not cloying, chocolate shavings with a hint of cinnamon. The almond cookie was not the usual round pebble but something that broke gently in the month, releasing waves of intense almonditidity. This is beautiful stuff-- if unlikely to fit the bill when you need a dozen for a meeting at work. And as for service... Remembering some long-ago LTH discussion of sfogliatelle, I asked if they ever made that. They plan to, the lady told me-- and then she took my name and phone number to let me know when they do. I'll be waiting by the phone. I've joined the chorus singing praise of Pasticceria Natalina. Friendly, spotless, delicious, attention to detail really does not cover the obsessive commitment to quality. Cannoncini "Little Cannons" light, flakey, the perfect resistance. After just one bite of Barca di Crema Pasticciera con Frutti del Bosco (Puff pastry custard boat with fresh berries) it's really going to be hard going any place else. Baba al Rum gets a second rum application before boxing. In a previous cannoli thread Pigmon lamented the lack of lightness in most cannoli fillings and Giovanna that most places fill in advance. Pasticceria Natalina's sheep's milk ricotta cannoli is filled on the spot and light as a feather. The filled cannoli in the case are only for display. Natalie and Nick Zarzour are a terrific team, friendly, gracious, caring. Any pastry cooks out there looking for a job, seems Pasticceria Natalina is hiring. I should note this week, and this week only Pasticceria Natalina will be closed both Monday and Tuesday, as opposed to Monday only. Last edited by G Wiv on March 14th, 2007, 4:55 am, edited 1 time in total. I too have been to Pasticceria Natalina twice this week and it seems my new favorite things are those fig cookies with white icing! Natalie and her husband are fantastic and I think they may be closing for two days this week because they are going on almost no sleep for the past couple days. Natalie bemoaned to me that they are the ones who are doing all the work right now, until they can find someone who can help out (I guess whoever was there before didn't work out). So they might be a bit sleep-deprived for being open these last 3 weeks, baking late every night and then selling during the day. The pastries, although expensive, are beautiful and made with care and love. We've tried the cream puffs and the triangle shaped pastries with nutella. And again I will say that I love the fig cookies! My boyfriend said to me, you know it's a good sign when you see the owner walk up to greet you and is covered in chocolate and flour. Nick and Natalie are the real deal. I send my five-year-old in to pick out stuff, I end up with stuff with colored sprinkles on it, even at Pasticceria Natalina. As it happens, that-- probably the "fig cookies" Sharona mentions above, or a close relative-- was probably my favorite thing out of the bunch, the fig filling with its hints of orange and various Christmassy spices was like the platonic ideal of a fig newton, multiple subtle and interacting flavors. The round object in front is made in honor of St. Agatha, and let's just say it does resemble a part of the body which played a major role in her martyrdom. Either fittingly or gruesomely, depending on your view of things, it was filled with a dairy product-- a light cheese. In back, a pair of flaky pastries, one topped with chocolate creme and pistachios, the other a croissant with a solid chunk of dark chocolate. We like Pasticceria Natalina. A lot. The fig cookie is a Cuccidatti. It should taste like christmas. This is the only time my sicilian grandmother makes them. I've never known others to make them as good as hers (even bits of chocolate in gramma's) so I will be curious to see if these are as good. I've asked why they're only made at christmas before and she tells me"because it's a lot of work"! I was there last night, and they were making marzipan. Natalie gave me a taste of their marzipan base (the finished ones weren't decorated yet) and it was really good, very smooth and not overly sweet. Marzipan fans rejoice! That's terrific, I was just going to ask about their marzipan offerings. My husband went in a couple of weekends ago but ended up leaving annoyed, since he wasn't acknowledged. This is forgivable, I think, as they clearly are a bit overworked at the moment. Perhaps I can convince him to go back this weekend - the pictures are killing me! Suzy Creamcheese wrote: My husband went in a couple of weekends ago but ended up leaving annoyed, since he wasn't acknowledged. This is forgivable, I think, as they clearly are a bit overworked at the moment. Talk with either of them and I think you'll find they are a nice, friendly young couple (and yes, they're clearly overworked). In case it's of interest, Bon Bon is an interesting shop making and selling artisanal chocolates next door to the north, open 12-8 Wednesday through Sunday. I just visited this afternoon for the first time. I found everyone to be friendly and very engaging. The obvious love for what they are doing shows through in both the interection with the staff as well as the finished product. The only negative thing I can say is that there are just too many things to try in a single visit. Has anyone mentioned that the cannoli are filled to order? Ethereal. And more new goodies daily. Today, just in time for my lunch, savory little pastries debuted, a whole selection of choices: spinach, peas, mint, prosciutto, artichoke hearts (no not all in one)...oh good Lord save me! Special goodies for Saint Joseph's Day; I was urged to return tomorrow to see what's new. The offerings just keep getting better and better. I was so truly thrown off balance by what I saw that I managed to buy three boxes (three boxes!!) and still forget the pistachio cookies I came in for. I can only thank my lucky stars that they chose this neighborhood to open. They assure me that business is good and for that I am grateful. Even in their short time in business, I've grown accustomed to their presence and cannot imagine the hole their departure would create. Even in the short time I was there, the door opened regularly. The only downside I see to this kind of care and attention to detail is that too soon they'll be as hard to get into as the Swedish Bakery. I wish many good things to them, but never that. As Suzy Creamcheese and nsxtasy both remark, they are overworked. It's plain as day, as is their devotion to what they do. Though they do have some excellent (Sicilian!) help, they may need a trifle more, but not with the pastries: Natalie and her work are gems. PS to stevez: all you need to do is walk out with multiple boxes. I figure my three boxes should last until some time oh, say, later this evening. PS to nicinchic: as I recall reading somewhere, the cuccidatti are one of Natalie's favorites and, though they may be specially for Christmas elsewhere (okay, everywhere else), she's fond enough of them to make them year round. Bless her heart! *PS to all: The Kitchen Dictionary tells us: "Amarena cherries are small, dark, slightly sour cherries grown mostly in Bologna and Modena.... The syrup is used to pour over cakes or ice cream. Amerena cherries are expensive and imported, and may not be easy to find them." Unless, of course, you know about P.N. And this, as much as anything, exemplifies the pasticceria to me: care in everything. 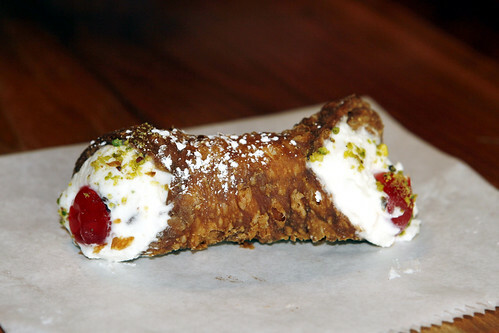 Gypsy Boy wrote: Has anyone mentioned that the cannoli are filled to order? Is this unusual in Chicago? It must be, because people are commenting on it, but having filled cannoli sitting around and getting soggy seems to defeat the whole purpose. And it takes all of a second to pipe in the filling, so it seems like only sheer lack of caring (on the part of both the baker and the customer) would make someone do it in advance. Sorry to hijack. This place looks really good, but the prices will likely prevent me from visiting all that often, if at all. If puff pastry + berries + pastry cream + Andersonville rent = $7, I can't even imagine how much the aforementioned sfogliatelle will run. cilantro wrote: Is this unusual in Chicago? It's not all that unusual, but it's not assumed, either. I'd estimate that 60% - 75% of Italian bakeries sell pre-filled cannolis. Cilantro wrote: Sorry to hijack. This place looks really good, but the prices will likely prevent me from visiting all that often, if at all. If puff pastry + berries + pastry cream + Andersonville rent = $7, I can't even imagine how much the aforementioned sfogliatelle will run. This comment seems odd to me on a food forum where most of us prize artisanal and high quality food stuffs, and where most of us are willing to make sacrifices toward the achievement of better food. I agree, you might not be able to eat there everyday, but, the place is so special that you should still patronize it occasionally. The quote almost suggests that you feel as though you might be getting ripped off. If we don't find ways to help people who care about craft and allow them to make a living, we'll be stuck in a Dunkin Donuts world. No one begrudges Doug Sohn for an 8 dollar sausage. If the homeless dudes who live outside my local White Hen can scrape together 7 bucks for a pint of Seagrams apple vodka, surely we can make the sacrifice for sublime pastry. Last edited by MJN on March 16th, 2007, 9:24 pm, edited 2 times in total. Thanks. These are generally in the Harlem area, right? MJN wrote: The quote almost suggests that you feel as though you might be getting ripped off. Not at all -- merely, that I cannot justify the expense to myself. Well, we tried again today, and at least one of us was mighty impressed. Suzy Creamcheese wrote: I loved the other things as well, but he didn't care for them. I didn't care for the fig cookies at all, either. I'm not a fan of spice cake/cookies and when I took my first bite, expecting to have more or less a frosted fig newton, I was blindsided with the taste of spice. Oh well, at least I loved everything else I bought. Minus the almond one and plus a handful of lemon cookies. Everything was delicious, but the amarena cherry topping was a true standout. As noted previously, Nick and Natalie are very nice and working very hard. I also thought that the cakes in the display case looked very appealing, although they don't appear to be available by the slice and I don't know the next time I'll need a whole one. I am jealous of my friends who live within walking distance, although I guess they will probably let me in the door if I return another weekend with treats from PN. This is my hood but today was the first day I was able to get over to this lovely place to give it a try. Even prepared for the prices, I was bit taken aback by them. 2 little pastries for $7 is not something I'm going to be able to do that often but I will say that this place is really tasty. I had a terrific filled on the spot cannoli and one of their cannoncini (not sure of the spelling here) which today was filled with hazelnut creme. And it was totally delish. May or may not have been worth $7 but I'm not sad I did it. Looking forward to the next time I want to bring in something special to work -- these will be LOVED. I picked up some treats for dinner this weekend and tried the marzipan, which was etheral. Not at all gummy like some marzipan I've had. I don't know if something can be light and dense at the same time, but this marzipan was. And they were gorgeous to look at. They also had samples of a pine nut coffee cake that I will definitely pick up on my next visit. Mike G wrote: I send my five-year-old in to pick out stuff, I end up with stuff with colored sprinkles on it, even at Pasticceria Natalina. As it happens, that-- probably the "fig cookies" Sharona mentions above, or a close relative-- was probably my favorite thing out of the bunch, the fig filling with its hints of orange and various Christmassy spices was like the platonic ideal of a fig newton, multiple subtle and interacting flavors. amazing things. They were not iced (which made em even better to me). early January, so thats the only time Da Riv sells em. recommend you try some (post your regulation Will-special sammy). Great find, c8w. I will keep this in mind for next Christmas. Last edited by Mike G on March 19th, 2007, 6:26 am, edited 1 time in total. See, the icing was what did it for me. The filling was almost too much - reminiscent of fruitcake with its heavy spicing - but topped with that sweet, mild icing, it all balanced out. As I was standing outside with the dog, nose pressed against the glass and wondering what delights my husband would be emerging with, I noticed the Help Wanted sign. And for a brief moment, I considered throwing myself to my knees in front of the proprietors and confessing that while I had no pastry experience save for baking a cake every now and then, that I was a quick study and would work cheap. Or free. Just for the excitement of learning how to make these amazing things. c8w wrote: Ive almost always only seen pre-filled cannolis. I don't recall ever seeing cannoli any way other than pre-filled. I'm not doubting that they are sold fill-to-order in some places, just noting that I've never seen them that way. Here's a question: In the places where they fill cannoli to order, how do you know that they're available and that they're filled to order? Do they put empty cannoli shells on display? Or do they put a filled one on display, but fill the ones you buy at the time you buy them? BTW, I believe cannoli is plural; if you buy just one, it is a cannolo. Last edited by nsxtasy on March 19th, 2007, 2:31 pm, edited 1 time in total. Il Mulino in Highwood has filled canolli on display. When you order one, it never comes from the display. The counter person goes to the rear to fill them. Whereas when I order lemon knot cookies, then those are taken directly from the case in front of me. There is some discussion in this thread of the availability of filled-to-order cannoli. I am also of the opinion that the best way to eat cannoli is when they're filled as close to eating as possible. In places that do this, they will often display the empty shells. The best way to find out is to ask. Some places that pre-fill, if it's not too busy, will fill one on request.